In our recent refresh of this higher-end condenser mic article we made some edits to the article content itself to bring it up to date for the end of 2018, as well as changing one mic recommendation. We removed the Sterling Audio ST66 and instead added the versatile superstar, the MXL V67i Tube. Think you need to spend a large amount of money to find a condenser microphone worthy of professional recordings? Think again! What Does a $500 Condenser Mic Have to Offer? While premium mics certainly have their benefits, the core performance and features necessary for serious studio work can still be found on mics in the higher-end of affordable. In today’s article we are going to show you some of the best condenser microphones on the market which can be yours for less than $500. As you’re about to find out, these mics are extremely capable and offer an impressive amount of value for money. Stick around after the chart as we give you the lowdown on what to look out for in a mic in this price range. Let’s get right into it! One of the most authentic tube microphones you can get right now. An unusual but ultimately impressive condenser mic offering plenty of great performance. Vintage tube tone and retro looks in a modern high-end mic. A true legend and the microphone of choice for many professional producers. Extremely versatile large diaphragm condenser that allows you to do precision work. Impressive large diaphragm handheld that brings high levels of detail and clarity. Kicking off this list of sub-$500 mics is the exceptional CV-12 from Avantone Pro – a large diaphragm tube condenser with a huge amount of flexibility. This flexibility is largely down to this mic offering nine different polar patterns, including omnidirectional, cardioid and figure-8. But it’s not a one trick pony, as the rest of the mic impresses greatly, in terms of design, build and performance. It includes a 6072A tube and twin gold-sputtered Mylar capsules, delivering an excellent sound for recording vocals. There’s more on this mic in the full CV-12 review. While the mic above is a real looker, nothing on this list tops the Spirit from Aston Microphones – a British brand that does things their way. Honestly, the chassis looks like something out of Mad Max, with its brushed metal finish and rugged cage surrounding the grille. But it offers more than just good looks, with a solid selection of components. 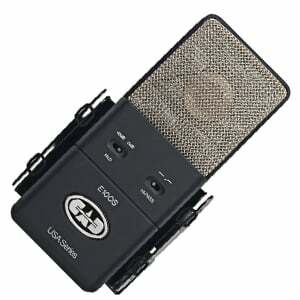 This includes 1” gold-evaporated capsule, quality electronics, and a built-in pop filter and shock mount. Sound quality and versatility – especially with three polar patterns – is great too. Check out the full Spirit review for all the details. A new addition to this list is the stunning V67i Tube from MXL, using the same glorious retro design and dual-diaphragm features of the original V67i, but with the addition of a 12AT7 dual-triode tube for a little vintage sparkle. As we highlight in the complete review of the MXL V67i Tube, the headline feature is the ability to switch between a ‘warm’ and a ‘bright’ diaphragm, to deliver two different sound profiles. With its eye-catching green and gold design, this versatile mic also features a high max SPL, so it’s as suited to instrument recording as it is vocals. The respected Austrian brand AKG offers up the C214, which is an impressive all-rounder in this price range. While not as flashy as the first two on our list, this large-diaphragm condenser still features a solid design with a cool vintage look. With a 1” diaphragm, a max SPL of 156dB and a -20dB attenuation pad, this side-address mic proves just as good for recording instruments as it is vocals, which come across smooth and warm. A well thought out mic that would be a happy fit in any professional studio – as we point to in the complete review of the AKG C214. Rode’s NT2-A is a great example of the Australian brand’s ability to deliver a quality mic and proves a fine successor to the legendary original NT2. For under $500, this side-address large-diaphragm condenser manages to deliver on design, functionality and performance. The NT2-A is loaded with some impressive features including a three-way high-pass filter, three-way attenuation switch and three switchable polar patterns (cardioid, omnidirectional and figure-8). Recording both vocals and instruments is a pleasure and relatively noise-free thanks to the high-quality Australian build. Want more on the NT2-A? Check out the complete review here. While the slightly unorthodox 1980s-esque rectangular design may not suit everybody’s tastes, the Equitek E100S from CAD Audio is an all-round excellent studio condenser mic. This large-diaphragm microphone’s USP is undoubtedly the fact that it offers top-notch circuitry which delivers the lowest self-noise levels in this category (3.7dBA), which makes for ultra-clean recordings. However – as we elaborate on in the full review of the Equitek E100S – this mic has a lot more to offer, with a large max SPL, high-pass filter and an attenuation pad. A wise choice for any studio engineer. The AE5400 from Audio-Technica may look like any other dynamic handheld mic, but it’s a condenser through and through – as we highlight in the complete AE5400 review. With a sleek but sturdy all metal build, this stage-friendly mic features top-quality components, including a large diaphragm, which delivers studio-quality vocals in a live environment. The specs and additional features help make this mic a winner for recording both vocals and aggressive instruments (especially with that high max SPL and attenuation pad). There is plenty of tech to help reduce unwanted noises too – essential for live performances! For beginners it is hard to distinguish one mic from another in terms of performance, whether that is a budget microphone or a higher-end model. 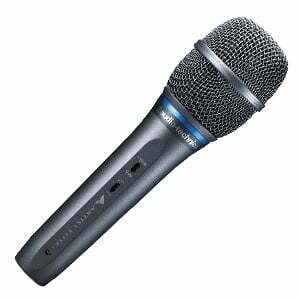 However, as you begin to reach a certain level of experience and skill, you will notice that every condenser microphone has a character of its own. Some mics work better with male voices, while others work better for the female voice. Some are better for detail, while others tend to capture the broader picture. Some are warmer in tone, others brighter and airier. All of this explains why many professional audio engineers tend to have more than one condenser mic in their collection! When you are chasing perfection, you start using condenser microphones like surgical tools. Each one has its own purpose and does a specific thing better than the others. This kind of refinement only begins to appear as you reach mics in the $300 category, although the models in this higher-end range are on another level. First up, the designs of mics in this range are excellent. You can certainly find great designs across the price spectrum, but you know as you reach the higher-end that there is no room for an ugly design. Mics such as the Spirit from Aston Microphones or the MXL V67i Tube just ooze quality because of their eye-catching and unique designs. While some mics in this price range can equally be pretty standard in their aesthetics, their build quality is what sets them apart from microphones in the lower ranges. Heavy-duty, scratch-resistant, all metal builds, usually made in Europe or America as opposed to the lower-end mics that are often made in Asia. While style is important, nothing is as crucial as the hardware, which is ultimately what makes or breaks a microphone. Achieving the highest levels of performance and fidelity requires solid hardware. Brands invest a lot of money and effort into developing new preamps, capsules and diaphragms and this is the price range where their highest-quality components tend to be installed. Most importantly, quality hardware allows manufacturers to optimize a microphone for a specific application, be it recording vocals or instruments, in the studio or on stage. As mentioned, improved hardware should result in an improved performance, worthy of professional application. Each mic in this higher-end price range should meet certain technical criteria, such as a wide frequency response range, high SPL handling, and very low self-noise levels. This is where most of the $500 condensers stand out from their cheaper cousins. Mics in this range also tend to have their own character, no matter how subtle it may be. Many are flat and are forgiving when it comes to different vocal profiles, while some bring their own unique color to the mix. Exactly what that color is depends completely on the model you choose, but in this range, you have a lot more choice. A mic costing up to $500 should also offer a more diverse package of features. For example, while each microphone is different, switchable polar patterns (sometimes up to nine!) is one feature you find more of in this region. This can help if you use the mic for several different applications – from recording a single voice to recording a whole orchestra. You will also find attenuation pads and various filters on every mic, some with multiple options. For example, a decent budget microphone may have a -10dB pad and a low-cut filter. The mics in the higher end offer more flexibility, with attenuation not necessarily limited to -10dB. Having these features may not be as important as having a solid core performance, but being able to make subtle adjustments directly on the mic can make a decent recording into a great one. Investing in a higher-end microphone, like the ones we have highlighted in today’s article, can be extremely liberating. It can be a big chunk of money to spend at one time, but depending on how proficient your skills are, you can have huge freedom of expression with these tools. The models we have selected in our chart are what we consider some of the best of the best in 2018. Hopefully they have at least provided you with some inspiration in your hunt for the perfect condenser mic!